Okay, so I had this stack of CD, including this one, to see some local W♥M writers to possibly review for me. Then, something happened, I decided to listen to a few albums on my drive to see them. I put in Soundpool's album, Dichotomies & Dreamland, not knowing what to expect, and was blown away by their music! They instantly made me think of the shoegazing genre. I was so impressed that I removed the album from the stack of CD right away and have decided to write about this album personally. This five-piece band is based out of New York City, and on their myspace description, it looks like they have trouble keeping their bass player (as there are three names attached to this position). It would seem, according to their liner notes, that Dean McCormick plays on most of the of the tracks on their album. I don't have their first album to compare notes, but it would seem that most of the music were written by John Ceparano with some collaboration with vocalist Kim Field, both are obviously big fans of early Lush[W♥M], Stereolab[W♥M], My Bloody Valentine[W♥M], etc. I really enjoyed "Do What You Love", it reminded me of Miki Berenyi's dreamy voice. This is really a great song, and even at five minutes, I still think it's too short! So one of the big problems for me is that I can never understand or hear clearly enough the lyrics being sung on shoegazing music. Thankfully, Dichotomies & Dreamland reprinted all the lyrics. If I hadn't read the lyrics, I would've never figure that this song is about war. Dichotomies & Dreamland is out now on Aloft Records (errr, not online???) in the US (alternatively iTunes) and Quince Records in Japan. PS, I really dislike the term "nu-gaze". September is not just the month, but the stage name for Swedish singer, Petra Marklund, who finally decided to try and take on the US with her self-titled US debut album last month (February 2008). I should point out that this album actually does not contain any new material, all the tracks are from her second (In Orbit) and third album (Dancing Shoes). If you don't have either UK albums and are into dance music, it's probably worth your time to check out the domestic release of September. As you know, I do have a pretty soft spot in my heart for all-things-Swedish and I've always admire that they take a music genre and kind of interpret it in their own unique way. Although September's music sounds like pretty standard dance pop music, there are some elements of 80s synth (her hit single, "Cry For You") to some great lyrically "sad" songs ("R.I.P. ", "Until I Die", and "Sad Song"). By the way, I should also point out that Marklund (like many of her popstar contemporaries) does not write her own music, so any praising of lyrics should fall to either of these music writers: Jonas von der Burg, Anoo Bhagavan, or Niklas von der Burg. Anyway, if you're a fan of diva dance singers like Sophie Ellis-Bextor, either of the Minogue sisters, Roisin Murphy, and Bertine Zetlitz - you might want to add September to your list. Her album's available in the US from Robbins Entertainment. Since some of you guys really liked Once and The Frames, I thought it's about time I talked about Stand, the rock band that's currently based out of Dublin, Ireland. I really think they have the passion and music that's very similar to The Frames... so if you liked Once, you should definitely check out Stand. Also, Lara wrote a concert review of the Stand at Bowery Ballroom in New York last February (set list for the show is available on their blog), in the review, she also talked about their last studio album, Travel Light. Well, I'm here to tell you more about the album. The actual CD has some cool die-cuts on the cover, so the liner note insert creates different colors - depending on how you insert in the sleeve. The CD comes with a companion 2-track disc cardstock called (cleverly) Travel Light 2-Piece Carry-On with "Days Gone" and "Sometimes" (note: "Days Gone" is available the album). I do have to agree with Lara, who mentioned the duel-singing between Neil Eurelle and Alan Doyle were infectious. There's just something really cool about two singers finishing up the other's sentences, because obviously they both need to be in tune with each other. You can hear evidence of this on "Days Gone" and "Carousel". The percussion is pretty amazing on "Who Made You Jesus? ", which at one point was really chaotic and caught me off guard. I also dig the George W Bush speech in the song... and especially in association with the song title. Other songs worth checking out are "Dressed to Kill" (a very catchy guitar rift), "Slave to the Weekend" (song can be heard on their myspace), "Low Culture" (the sudden stop in the song is cool!) and "Carousel" (I like the experimental sound). Overall, a great CD package with some great songs. So what's new with Stand? They have decided to re-release their original 2005 album, Transmission. The new and improved (remastered) album will be released April 21st exclusively on their store. Travel Light is available now. Pennywise was named after the clown from Stephen King's novel, It. Pennywise, the Californian punk band, gave away their latest album, Reason to Believe, for free on myspace as of March 25th. It's cool, I don't consider that spam, I'm always happy to check out free music. After downloading the zip file, I was surprised that they thought to included the booklet (PDF) and the mp3 files were at a high bitrate (320kbps). listened to the whole thing in detail yet, but a few songs stuck out right away, like "It's Not Enough To Believe". The ones that I really liked are really fast and loud (but with melody!) and are pretty much reminds me of early Pennywise, very old-skool. Get the latest album from Pennywise on myspace. Speaking of Californian punk, Bad Religion's Greg Graffin will be honored with a Lifetime Achievement in Atheism, Punk Rock, and Science. We've mentioned The Cribs previously, so you should be familiar with them by now. They played here last night (March 26th) at the Varsity Theater in Minneapolis. I've always liked the Varsity because there's couches and seats, so it's not really an ideal "rock" venue, if you get my drift. They also ulitizes their lights, so it's definitely a lot more exciting to watch than, say, most venues that have no or little light-action. Unfortunately, there is a missing 35W bridge, so I was a little confused and lost finding the theater and ended up missing the two opening bands, Ra Ra Riot and Jeffrey Lewis. 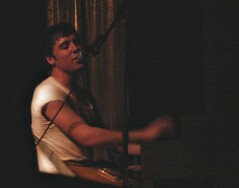 I was told by attendees that Lewis was a one-man folk singer and that the crowd really loved Ra Ra Riot. I always have the biggest respect for warm-up acts, because they have to rock twice as hard working an audience that's essentially not there to see them (this is why I always try and make an effort to spotlight the openers). To be honest, I wasn't really into the show, but I can tell that the audience loved The Cribs, dancing and singing along. The highlight of the show was when (I think) Ryan went to play on a prop piano and started making up some lyrics about the Kooks and something. The brothers ended the set with "Ancient" and they did the rock 'n roll thing and aped out at the last song. Hailing from Denmark, Under Byen will be releasing their live EP, Siamesisk, tomorrow (March 27th). Originally the five songs were recorded and aired live on both Denmark radio and television, and through special arrangements, the band released this recording on CD/Vinyl in their native country on Feb 18th (US release date is tomorrow). The EP is only limited to 2,000 CD copies and 500 vinyl copies, so coming across one might be difficult, so I suggest you order it online. So, I'll tell you a little about the band: apparently the name of the band is Danish for "under the town" (all translations were done via tranexp.com). As heard on this EP, you quickly realize that they employed a wide range of classical instruments, as seen in their grand video for "Den Her Sang Handler Om At Få Det Bedste Ud Af Det". Their often strange jazz-sound, combined with that oh-so-quiet-voice of singer, Katrine Stochholm, it made me think of (later) Bjork and even Portishead. Overall, keep an ear and eye out for this EP at your local import store. Should be worth looking into if you love Bjork. A week or two ago, I got a package in the mail from Vu. In it were two CD's for review, and due to illness, and being really busy with other things, I kinda ended up sitting on 'em for a while. One of them caught my eye instantly, and I decided that that's the one I'm going to be talking about first. Nuclear Lipstick by Crazy Mary has an album cover that can only be described as bizarre, in that “90's throwback” sorta way. It could probably be mistaken for a bad post-grunge CD based on the cover alone. Fortunately, that's not at all what we have here. Overall, while it's not something I'd typically listen to, it's still definitely a pretty good listen, especially in the right mood, and I'm sure quite a few people reading this will enjoy it. Unfortunately, I don't have any tour dates or anything to post. The band's website and MySpace page list nothing. But I'll definitely be keeping an eye out for 'em! This week's news involves very well-known acts, so there's no need for introduction on any of these bands. I will add my own personal insights on the news, however. The Raconteurs release their sophomore album Consolers Of The Lonely through Third Man Records/Warner Bros Records on today (March 25th). I do like The White Stripes and based on some quick listen of this new album, I think I'm going to like this new album. It's very guitars and Jack White does a lot of singing on this album. Back in Nashville in May 2007 they made their first venture into the studio, putting a plethora of ideas down on 16 track tape; a method that gave them the freedom to try out arrangement and editing ideas they’d come up with during the writing process. When they came back to the ideas in the fall, following a brief hiatus where they all worked on other projects, they were able to turn them into a rich 14 song masterpiece, a far more bombastic and inventive album than their debut. Consolers Of The Lonely, with all of its twists and turns, is a spirited, dynamic and endlessly impressive album. Death Cab For Cutie, another huge band, have a new single called "I Will Possess Your Heart" from their forthcoming album Narrow Stairs, which was produced and mixed by Chris Walla[W♥M]. Details of the album, due out on May 13th, and tour dates are available on their press release. I've listened to the song a few times now and I can tell you that it's a slow-building song. The bass is really good at the intro, and the lyrics doesn't kick in until 80% of the way in. I suspect they may have to edit down to 3 minutes and cut out the epic intro, if they are to promote this to radio. The song definitely has that Chris Walla touch, read Ceji's review on Field Manual. THE DRESDEN DOLLS Release New LP This May! The Dresden Dolls are back with No, Virginia on May 20th, and it looks like it's a weird collection of new songs and some old, demos, and b-sides. It's not a greatest hits, it just looks like a companion album to Yes, Virginia (2006). Having spent nearly two years solid on the road since the release of Yes, Virginia, including tours with Panic! at the Disco, the True Colors tour with Cyndi Lauper and The Gossip, and their own sold-out headlining shows across the country, The Dresden Dolls are proud to put their newest collection of songs into your hands very soon. Due for release on Roadrunner Records on May 20th, 2008, the band’s new album, entitled No, Virginia, is made up of new songs, old demos and b-sides from the Yes, Virginia sessions. A startling companion album to an old fan favorite, No, Virginia is ripe with the incredible songwriting by which the Dolls are defined, and presents some of their best playing yet: Amanda’s piano may literally be turning to dust from the strength she’s using to bang on it, while Brian’s drums carry every melody on their sturdy snare snaps and chaotic cymbal crashes. Topped by Amanda’s uncontainable, multi-dimensional voice, No, Virginia contains some of the best songs in their repertoire. Read more about The Dresden Doll from Silpa. The first time I mentioned Strawberry Fair, I had no idea it's actually just one person: Jenny Franzén. The talented Franzén wrote, played, recorded, and self-published via CD-R all the music herself. Strawberry Fair - Where is Alex Taylor Now? Her first proper CD release, I Can't Do Anything, features all the aforementioned writing, producing, recording - down to her drawing of the cover artwork. When I saw the art, I felt as if she's daydreaming about travelling (to a warmer location probably!) or singing on stage and so I've included my drawing reaction. I was happy to see a new recording for "Kristoffer" because I have a rough mix recording of that song from a few years ago. In fact, Franzén mentioned to me that all the songs on the new EP were written between 2004-2005 and meant to have been included on the My Secret Garden compilation, but she took too long mixing the songs (only "Attack!" made it on the CD). All these songs have a very 60s girl-pop feel to them, especially "Why Won't He Answer" and "Give Up". Like the 60s girl pop bands, they all seem to involve falling in love - but in Franzén's case, it sounds like she's failing in love and you get the impression that she's painfully shy too. I have included the main title track, "I Can't Do Anything", which you can download on her myspace. I'm hoping to hear more songs from Franzén in the future. She definitely has enough songs to release a full length, back in 2003, but the plans didn't fall through. I actually have about 20 songs (from 2003-2005) and since they were all under the 3 minute mark, they all fit in one CD-R for me to listen to in my car. There's a few gems in the various tracks, so I'm hoping they get remixed or re-recorded and release in the future. These gems includes "Lise Meitner" (a song about the nuclear scientist that was denied the Nobel Peace Prize), "Heaven Only Knows" (a Shangri-Las cover), and "Untitled" (I'm sure she's come up with a proper title now). I'm also pleased to see that she's recently allowed "Regression" and "Football Star" for download on her last.fm. 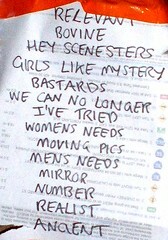 These songs, along with "Unbuoyancy", appears on her self-titled EP. I kept skipping back to the beginning, over and over again, on the "Attack!" song, a cover of The Toys. Despite lacking the horns and soulful singing-style of the original, Franzén actually improves on the song. Strawberry Fair's version feels more modern with its lack of doo-wop backing vocals and faster pace. 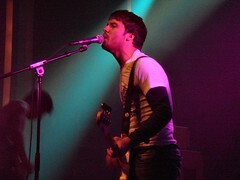 The song constantly moves forward, which reflects the lyrics. During my research, I noticed that there is an English traditional song called "Strawberry Fair" (you can listen to samples the folky song on iTunes). I haven't verified this, of course, but I'm guessing that Franzén took this song for her stage name? Edit: the name comes from a My Little Pony of the same name. I met a maiden taking her wares, fol-de-dee. As she went on to Strawberry Fair. Well, even if she didn't take that name, the song's still lovely - just like Jenny Franzén. I Can't Do Anything is out now, head over to facetterad.net for general and ordering information. Also, please be sure to read Strawberry Fair - Where is Alex Taylor Now?.